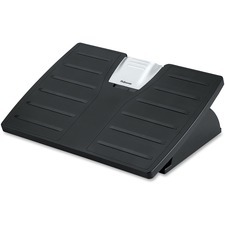 Unique footrest features an incremented rocking action to promote circulation and muscle stimulation by encouraging leg movement. Easy-to-adjust, just apply foot pressure to change position. Smaller footprint takes less floor space under desk. With anti-skid feet. Width: 17 1/2"; Height: 3 1/2"; Depth: 11 1/2"; Color(s): Black.